MEP Foam Pusher Eductor Assemblies are effective mechanisms for eliminating foam in dip tank applications as well as stirring similar to MEP's standard eductors. Our Foam Pusher Nozzle Bodies are polypro material for high temperature and chemical resistance. Foam Pusher Bodies fit to our E-Z Clip-on Nozzle Bodies and our patented "Snap RisersTM" for "qwik installation. Additionally, we offer o-rings and seals in Buna, Hyplalon and VitonTM to meet any chemical need. Standard foam pusher educators are listed below. 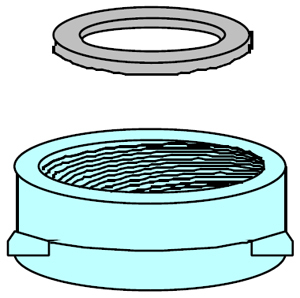 To make a part number for a Foam Pusher Educator Assembly, simply add Pipe Size, then Seal Material, followed by the Spigot Size, and last, if it is an O-Ring, or a Flat Seal. Available in Flange or Lug type valves! Bolt packs for both types of Butterfly Valves are in stock: Zinc plated or Stainless Steel. Contact us for Pricing! Made with stainless steel hardware, and Buna N rubber plugs. All expansion plug assemblies have the pre-fix "EP" then pipe size and the suffix "HEXASSY". 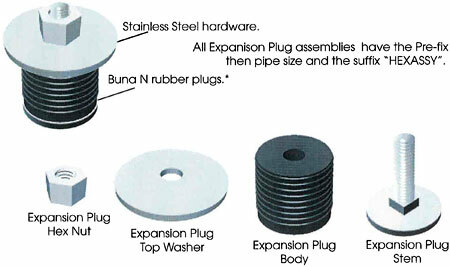 EP125STE 1-1/4" Expansion Plug Stem, 304 S.S.
EP125TOPWAS 1-1/4" Expansion Plug Top Washer 304 S.S.
EP150STE 1-1/2" Expansion Plug Stem, 304 S.S.
EP150TOPWAS 1-1/2" Expansion Plug Top Washer 304 S.S.
EP200STE 2" Expansion Plug Stem, 304 S.S.
EP200TOPWAS 2" Expansion Plug Top Washer 304 S.S. 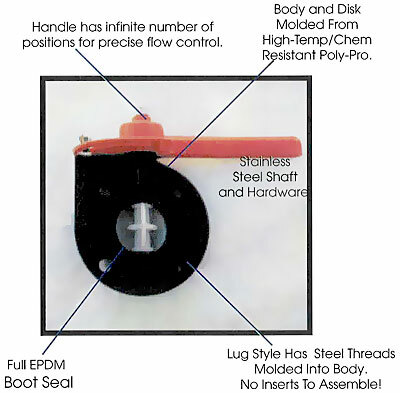 Optional seal provides for a “hand tight” fit -no tools, Telfon tape or glue required! MEP Riser Support Clamps and Support “Strut” works with Snap Risers as shown left as well as typical CPVC/PVC and steel pipe. When ordering “Riser Supports”, indicate the type of Riser Support, clamp or “strut”, riser pipe size (Snap Risers™ requires a 1-1/2” Riser Support Clamp) and the quantities required. 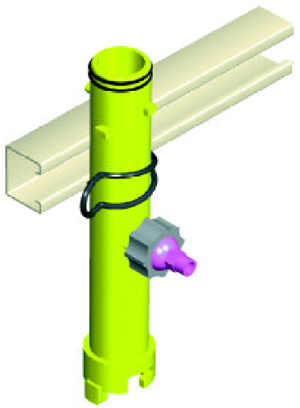 Support “Strut” comes is available in Non- Corrosive Fiberglass, Mild Steel and Stainless Steel. “Strut” comes standard in 10 ft. lengths but can be cut to other dimensions as required. Note: There are additional charges by UPS to ship strut in 10 ft. lengths. US1000 Uni-Strut 20V-1000 Non Corrosive 1-1/8" x 1-1/2"
US2000 Uni-Strut 20V-2000 Non Corrosive 1-5/8" x 1-5/8"
US2100 Uni-Strut 20V-2100 Non Corrosive 1-5/8" x 3-1/4"
USC3100 Uni-Strut Clamps 200-3100 Clamp 1/2" to 1-1/2"
USC3110 Uni-Strut Clamps 200-3110 Clamp 1-1/2" to 2-1/4"
USC3120 Uni-Strut Clamps 200-3120 Clamp 2-1/4" to 3-1/4"